and step by step replacement guide. Thermocouple replacement is a simple process. If your handy with tools you shouldn't have any problems. 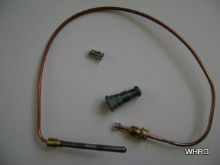 Go to thermocouple parts page. Also called universal water heater thermocouple. It screws into the bottom of the gas valve and a probe on the other end slides into a holding bracket near the pilot light. It looks like a piece of copper wire ( see pic. below). This thermocouple has a right handed thread. Turn right to tighten left to loosen. Universal thermocouples come in lengths from 15 to 36 inches. An 18 or 24 inch will suffice for all residential water heaters using universal kits. Almost all older waters heaters and many of the newer style units with a sealed burner compartment and a viewing window will use this thermocouple. If you want to use an exact replacement length just remove your old one and measure it. Thermal Cut Off style has a resettable thermal shut off switch integral into the thermocouple. In the event of a flash fire or blow back from the burner the TOC will shut down gas flow to the burner and pilot. In case of a shut down the TOC should reset itself after it cools down and allow you to relight the pilot. The TOC switch looks like a watch battery. You will only find the TOC on newer style water heaters with seal burner compartments. These thermocouples have a tiny TOC build inside the tube. They look similar to a standard one except the diameter is larger about midways of the tube. When these TOC's switch off they will not reset and must be replaced. Some of Whirlpools older model water heaters were built with a left-hand thread thermocouple. Turn to the left to tighten, right to loosen. These are no longer available. You can also purchase one directly from Whirlpool at about the same price. Their costumer service number 1-866-698-2538. These water heaters were built by American Water Heater Co. They have a lot of "how to" replace parts guides for their water heaters. Follow the link below. A pilot thermocouple sends a tiny electrical current to the gas valve when the probe is heated to a certain temperature. This electrical current tells the gas valve that the pilot is lit and its ok to send gas to the burner if the thermostat calls for it. 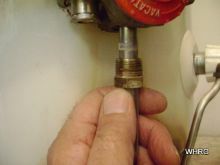 To check a water heater thermocouple press the pilot button down on the water heater gas control valve. Light the pilot. If after holding the pilot button down 30 to 60 seconds the pilot light goes out when you release the button, the thermocouple is most likely at fault on older units. The TOC or air flow could be the problem on newer units with a pilot light viewing window . If the pilot does not light at all the problem is gas flow, gas control valve, TOC tripped. The tip on the thermocouple probe has deteriorated. 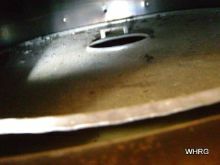 Lack of air (oxygen) on seal burner water heaters. If the probe looks white this is carbon build up. It can keep the probe from getting hot enough to send a signal to the gas valve. Sand it with emery cloth and relight the pilot. It should work for a while but keep a new thermocouple handy. The thermocouple probe must be in the pilot light flame. 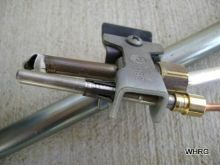 The thermocouple must be screwed into the gas valve tightly. Check the pilot thermocouple tube for kinks. Always follow all safety rules when working around gas. 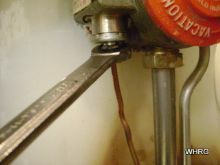 A universal water heater thermocouple can be found at most hardware stores. In the guide below I've removed the burner assembly so you can see how the thermocouple is positioned next to the pilot. This is a universal thermocouple kit. It will fit most water heaters. Turn the gas off to your water heater. 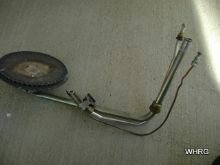 Remove the outer and inner burner assembly access panels. 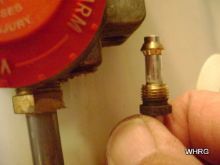 Remove the thermocouple from the gas control valve using a 3/8 in. end wrench (see picture above). A hard tug should do it. instructions to remove the burner assembly. Got the thermocouple out? Good. slide the probe into place. 1/8 to 1/4 in. pass the pilot head. Attach the other end to the gas control valve. You'll have to remove the water heater burner. from the gas control valve. 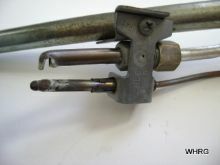 thermocouple with a pair of pliers. the tip of the probe 1/8 to 1/4 in. that holds it in place (see picture). your ready to light the pilot light. Light the pilot on older style water heaters. Light your pilot light on FVIR style units.